There are no cameras at Lake Texoma. If you know of some, contact us about them. 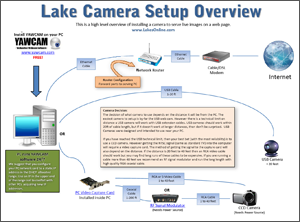 Lakes Online provides free consultation to businesses that would like to setup a web cam. Required equipment is a computer with broadband access. Web camera software is free. The type of camera you need is dependent upon the distance from the computer. Download free guide to setup a web cam.